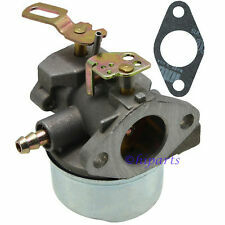 Carburetor carb for Tecumseh 10HP 640260 640260A 640260B 632689 HM80 HM85 HM90 HM100 LH318XA LH358XA LH358EA. Tecumseh Parts No : 640152 640152A 640260 640260A 640260B 632689. Fit for Tecumseh Engine: HM80 HM85 HM90 HM100. HMSK80 /HMSK90 / LH318SA / LH358SA. NEW 8HP, 9HP, & 10HP CARBURETOR! FITS TECUMSEH MODELS Carburetor for Lawnmowers. Gas residue in the carburetor is for test purpose by manufacturer. 1 x Carburetor 1 x Gasket. 640260 / 640260A / 640260B / 632689. Fits Tecumseh models. Carburetor for Snowblower LH318XA LH358EA LH358XA 8-10Hp Coleman Generator. Gas residue in the carburetor is for test purpose by manufacturer. TECUMSEH 640349 / 640052 / 640054/h4>. 1x Carburetor. We will respond within 24hr. Support is available 24/7. 640260 / 640260A / 640260B / 632689. HM80 / HM85 / HM90 / HM100. Fits Tecumseh models. Carburetor for Lawnmowers. Carburetor for Snowblower LH318XA LH358EA LH358XA 8-10Hp Coleman Generator. Gas residue in the carburetor is for test purpose by manufacturer. 640152, 640152A, 640023, 640051, 640140, & 640112. Fits Many Tecumseh HM80, HM90, & HM100 Engines. Tecumseh VM80 Engine, Tecumseh 10 HP HM100 Engine, Troy-built Wood Chipper, 8HP Shredder, ect. Replaces Tecumseh. 640152, 640152A, 640023, 640051, 640140, & 640112. Coleman PowerMate 6250 10 HP Generator, Craftsman Snowblower. Coleman PowerMate Maxa 5000 Er Generator. Tecumseh VM80 Engine, Tecumseh 10 HP HM100 Engine, Troy-built Wood Chipper, 8HP Shredder, ect. Replace Tecumseh 640052, 640054. HMSK85, HMSK90, HMSK100. Fits Tecumseh engine model HMSK80. 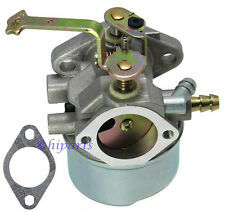 Carburetor replaces Tecumseh Nos.640152A 640023 640051 640140 640152. Fits Many HM80, HM90 & HM100 8-10 HP Engines Mower 5000w Generator. HMSK80,HMSK85, HMSK90, HMSK100, HMSK105, HMSK110, LH318SA, LH358SA. Fits Many Tecumseh 8hp, 8.5hp, 9hp, 10hp, 10.5hp, & 11hp Engines. Replaces Tecumseh Fits Tecumseh Models New Carburetor w/ Gasket. Fits Many HM80, HM90 & HM100 8-10 HP Engines Mower 5000w Generator. Carburetor Carb for Tecumseh HM90 8HP 9HP 10HP Engine Mower 5000w Generator. 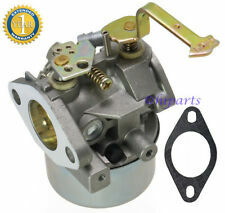 Carburetor replaces Tecumseh Nos.640152A 640023 640051 640140 640152. 640260, 640260A, 640260B, 640269, & 632689. HM80, HM85, HM90, HM100. Fits Many Tecumseh Engines Replaces Tecumseh New Carburetor w/ Gasket. LH318XA, LH358XA, & LH358EA. Replaces Rotary 520-956 & 056-320. Fits: Tecumseh 640349 640052 640054 640058 640058A. Models:Tecumseh HMSK80, HMSK85, HMSK90, HMSK100, HSMK110, LH318A, LH358SA. This carburetor is adjustable with high and low speed screw. 1 x Carburetor. Fits: For Tecumseh HM80 & HM100 engine with 90 degree fuel fitting. 1 x Carburetor. We are committed to resolve all issues in a friendly and satisfactory manner. Replaces Part #: 640023 / 640051 / 640140 / 640152 / 640152C. Carburetor F Generac 8795 C5000 4000 5000 Watt Generator Tecumseh 8HP 10HP Carb. 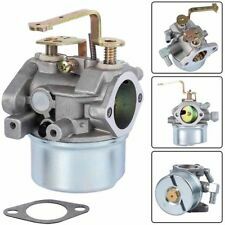 Carbhub 640052 Carburetor for Tecumseh 640349 640054 640058 640058A HMSK80 HMSK85 HMSK90 HMSK100 HSMK110 LH318A LH358SA 8HP 9HP 10HP Snowblower Generator Chipper Shredder - Tecumseh 640052 640054 Carb. HMSK80 HMSK90 LH318SA LH358SA. • Carburetor x 1. Our products and service will speak for themselves! and accessories for all types of cars, trucks, ATV, UTV and motorcycles. With a high rate. Fits Many HM80, HM90 & HM100 8-10 HP Engines Mower 5000w Generator. 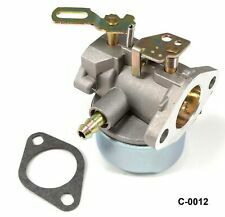 Carburetor replaces Tecumseh Nos.640152A 640023 640051 640140 640152. Gas residue in the carburetor is for test purpose by manufacturer. 640152, 640152A, 640023, 640051, 640140, & 640112. Fits Many Tecumseh HM80, HM90, & HM100 Engines. Replaces Tecumseh New Carburetor. Replaces Rotary. Coleman Maxa 5000 10hp Tecumseh Powermate Generators. 1x Carburetor. 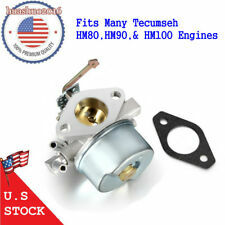 Fits Many Tecumseh Engines: HM80, HM85, HM90, HM100. So, you can imagine how important it is! A fully-equipped carburetor assembly is composed of several parts, so it could help engine work perfectly. 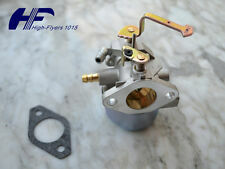 Replaces Carburetor Parts No: 640152 640152A 640260 640260A 640260B 632689. HM80 HM85 HM90 HM100 Snowblower, Coleman, craftsman generator, LH318XA, LH358EA Lawn mower Engines etc. (E.g. you brought wrong size or wrong item). For Tecumseh 640349. for Tecumseh Nos. for Tecumseh 640025B. 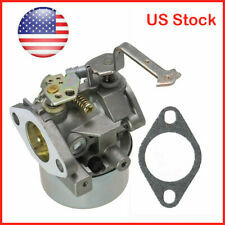 USA CARBURETOR Carb for Tecumseh 632334A 632111 HM70 HM80 HMSK80 HMSK90 Engines. for Tecumseh 632334A. for Tecumseh LH195SP. Gas residue in the carburetor for test purpose by manufacturer. Description Carb for Coleman Powermate 8HP 10HP ER 4000 5000 Watt Generators 6250 Tecumseh This Carburetor fits Coleman Powermate generators with Tecumseh Engine, model like 6250. Please be noted some 6250 Generators from different years are not using Tecumseh Engine, we suggest you to check the original carb for sure. Package contains: 1 X Carb , 1X Gasket Please verify photos for best match. Please check pictures for more details Compatible Carb for Coleman Powermate 8HP 10HP ER 4000 5000 Watt Generators 6250 Tecumseh Key Features. Fits Tecumseh Models Replaces Tecumseh Part Numbers NEW CARBURETOR w/ GASKET. 056-326 & 520-962. Replaces Stens Part Numbers 632113 & 632113A. HS40 & HSSK40. Fits Many HM80, HM90 & HM100 8-10 HP Engines Mower 5000w Generator Replaces Tecumseh Nos.640152A 640023 640051 640140 640152. 640260 / 640260A / 640260B / 632689. Fits Tecumseh models. 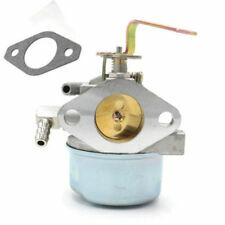 Carburetor for Snowblower LH318XA LH358EA LH358XA 8-10Hp Coleman Generator. 1 x Carburetor. Fits: For Tecumseh HM80 & HM100 engine with 90 degree fuel fitting. 1 x Carburetor. We are committed to resolve all issues in a friendly and satisfactory manner. 1 x Gasket. Replaces for Tecumseh 640260 640260A 640260B 640023 640051 640140 640152 640152A. Fits for TECUMSEH HM80 HM90 HM100 LH318XA LH358EA Snow Blower. For Tecumseh 640260 640260A Carb HM80 HM90 HM100 LH318XA LH358EA Snow Blower Craftsman. Tecumseh 640152 640152A 640260 640260A 640260B 632689. Tecumseh HM80 HM90 HM100 LH318XA LH358EA Engines. 1x Carburetor as the picture. Three months warranty. We will try our best to reduce the risk of the custom duties. 640349, 640052, & 640054. HMSK80, HMSK85, HMSK90, HMSK100, HMSK105, HMSK110, LH318SA, LH358SA. Fits Many Tecumseh 8hp, 8.5hp, 9hp, 10hp, 10.5hp, & 11hp Engines. Replaces Tecumseh Fits Tecumseh Models. 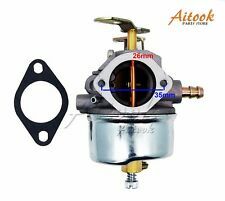 Carburetor Carb for Tecumseh HM90 8HP 9HP 10HP Engine Mower 5000w Generator. 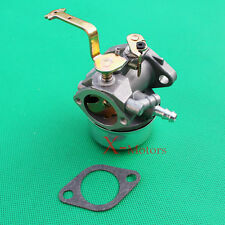 632334A Carburetor for Tecumseh 632370A 632110 632111 632334 632370 632536 640105 - Tecumseh 632334a Carburetor. TecumsehTecumseh 632110 632111 632334 632370 632536 640105 632334A 632370A Snow Thrower Snowblower. For Tecumseh LH318SA LH358SA for Snow Blower Generator Chipper Shredder. Carburetor for John Deere Snow Blower Thrower TRX24 TRX26 TRX27 TRX32 TRS22 TRS24 TRS26 TRS27 TRS32 8 HP Units. For Tecumseh 8hp 9hp 10hp engines, HMSK80 HMSK90 Generators. Fits: Tecumseh 640349 640052 640054 640058 640058A. Used on Snowblower, Generator, Chipper and Shredder. Models: Tecumseh HMSK80, HMSK85, HMSK90, HMSK100, HSMK110, LH318A, LH358SA. 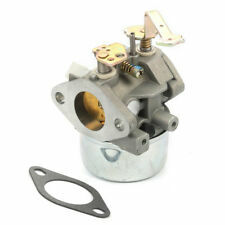 New Carburetor 594015 For Briggs & Stratton Lawnmower Supersedes 593358. HMSK80, HMSK85, HMSK90, HMSK100,HMSK105, HMSK110, LH318SA, LH358SA. Fits Many Tecumseh 8hp, 8.5hp, 9hp, 10hp, 10.5hp, & 11hp Engines. Replace Tecumseh 640052, 640054,640349. Fits Tecumseh engine model. Replaces Tecumseh: 640152, 640152A, 640023, 640051, 640140, & 640112. Fits Many Tecumseh HM80, HM90, & HM100 Engines. Model: Carburetor Carb. Hope you can understand. Replaces Stens:520-954 & 056-318. • Carburetor x 1. and accessories for all types of cars, trucks, ATV, UTV and motorcycles. With a high rate.